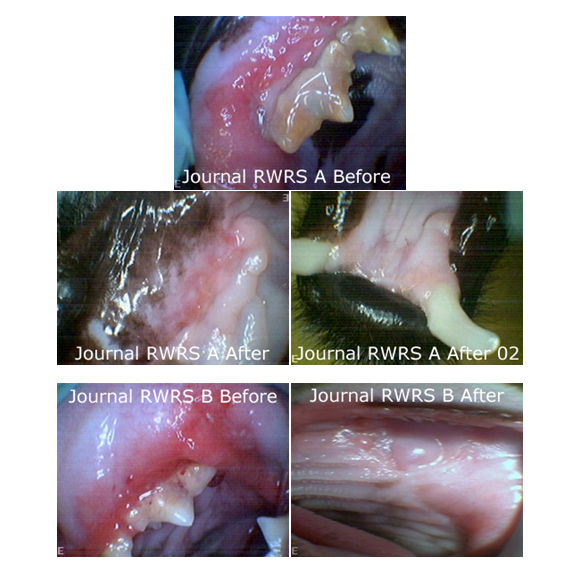 The Treatment of Feline Stomatitis: A New Surgical Protocol Combining Radiosurgery with Guided Bone Regeneration [GBR] utilizing Consil®/Bioglass® Synthetic Resorbable Bone Graft Particulate. The classic treatment of feline Stomatitis with whole mouth extraction or extraction of the teeth distal to the canine teeth has proven to be non-productive. Anywhere between 50-65% of these felines have only short term improvement with a return of the oral inflammatory condition in 6 to18 months. On the other hand, the alternative surgery, herein described, utilizing Radiowave Radiosurgery to create full thickness mucoperiosteal flaps, combined with osseous surgery, and bone augmentation have proven to be completely successful. Dr. Robert Wiggs, identified by many as the “Father of Modern Veterinary Dentistry” writes in Veterinary Dentistry Principles and Practice: Lippincott-Raven-1997 about the importance of Guided Tissue Regeneration. From Dentistry.com-the following definitions from human dentistry might help explain the terms GTR and GBR. Refers to procedures that attempt to regenerate lost periodontal structures, such as bone, periodontal ligament and the connective tissue attachment that support our teeth. This is accomplished using biocompatible membranes, often in combination with bone grafts or tissue stimulating proteins. Refers to procedures that attempt to regenerate bone prior to the placement of bridges or, more commonly, implants. This is accomplished using bone grafts and biocompatible membranes that keep out tissue and allow the bone to grow. Bioactive glass materials such as PerioGlas (Biomaterials) or BioGran (Orthovita) are a form of glass particles upon which a layer of apatite forms, thus promoting bone formation. [ Wheeler DL, Stokes KE, Hoellrich RG, et al. Effect of bioactive glass particle size on osseous regeneration of cancellous defects. J Biomed Mater Res. 1998;41:527-533.]. In the Journal of Veterinary Dentistry, Vol 14, No. 4-Dec 1997-Evaluation of Bioglass®/PerioGlas™ [Consil®] Synthetic Bone Graft Particulate in the Dog and Cat-DH DeForge, VMD -GBR is described. Bioglass® Synthetic Bone Graft Particulate [PerioGlas™/Consil™] was utilized to treat osseous periodontal defects, and in post-extraction sites to maintain the vertical height and width of the alveolar ridge. The material is easy to use, inhibits epithelial down growth, and acts as a mechanical hemostatic agent. Radiographic follow-up in 36 dogs and 5 cats demonstrated significant bone fill. In the osseous periodontal defect treatment group, clinical probing depths deceased significantly, and there was an apparent gain in attachment level. This synthetic bone graft particulate improves the rate of osseous growth while being resorbed and replaced with bone during the healing process. This original work led to the utilization of Consil®/Bioglass®, synthetic bone graft particulate, in a feline stomatitis surgery technique developed by Dr. DH DeForge. When implanted in stomatitis felines, a material surface reaction results in the formation of a calcium phosphate layer that is similar in composition and structure to the hydroxyapatite found in bone mineral. This apatite layer provides the scaffolding onto which the patient’s new bone will grow allowing repair of the bone defects in feline oral stomatitis. Diseased bone is removed and new bone is created to allow the patient to fully recover from the inflammation and pain caused by the pre-surgical oral pathology. The hypothesis that the cats affected with stomatitis suffer from a bone disease rather than a dental disease has been confirmed by Dr. DeForge with this new surgical approach to the disease. The confirmation is the actualization of complete and permanent clinical improvement after Dr. DeForge’s GBR surgery in the edentulous patient [i.e. patients having had earlier whole mouth extraction surgery by other surgeons prior to referral to Dr. DeForge]. In these felines, where the whole mouth extraction technique had failed, GBR Feline Stomatitis Surgery succeeds confirming the origin of the pathology as a bone-centered pathology. Before patients can be treated by Dr. DeForge with his surgery utilizing radiosurgery combined with GBR, a very comprehensive pre-anesthetic screening must be completed. This screening includes clinical chemistry, serology, hematology, and special imaging to rule out other medical problems that might co-exist with stomatitis. Feline Cardiomyopathy and Low Grade Lymphoma and Chronic Lymphocytic Leukemia [CLL] are problems that have been noted in felines referred to Dr. DeForge for his surgical treatment of stomatitis. Cats with HC are examined by a cardiologist and pre-treated prior to surgery with cardiologist approval for anesthesia. The Lymphoma patients and CLL patients are not candidates that will be helped with stomatitis surgery. Other patients present with Feline Immunodeficiency Virus infection. These patients are confirmed as true FIV + patients by Western Blot testing at the National Veterinary Lab. The FIV+ patient can be treated with stomatitis surgery with the client realizing that the recovery period will be lengthy. All cats undergoing this surgery are Feline Bartonella tested by the National Veterinary Laboratory. Dr. William Hardy at the National Veterinary labs identifies a subset of Feline Bartonella positive felines with a stomatitis-like pathology, under a year of age, that respond very well to treatment with Azithromycin. Feline Stomatitis cats over twelve months of age that are Feline Bartonella positive, as identified by Western Blot testing at Dr. Hardy’s laboratory, will not respond with Azithromycin. They are still treated with Azithromycin prior to surgery because of the fact that Bartonella poses a zoonotic threat. The older Feline Bartonella + positive feline with stomatitis will need GBR surgery to recover. All patients that are presented for feline stomatitis surgery have biopsies to rule out oral cancer and confirm that they are truly oral stomatitis affected felines. The following pictures are before and after pictures from two different patients who both had Dr. DeForge's Feline Stomatitis Radiowave Radiosurgery with GBR Parts I and II performed. Notice the significant decrease in inflammation and ulceration in the after photographs in comparison to the before photographs. All of veterinary dentistry centers on communication. Comprehensive oral care involves excellent Problem Oriented Oral Medical Records; detailed oral exams; precise oral radiology; and thorough identification of all pathology. The Modified Triadan Numbering System is the key that unlocks a unique nomenclature that allows for an exchange of medical information from............... practitioner to client and....... in referral cases....... to the animal dentist. We live in an age of telemedicine. To communicate in medicine standards must be utilized that are universally accepted. The new Millennium has brought great advances to the oral care of companion animals. Veterinary dentists are now preserving teeth routinely with root canal therapy. Damaged dentition can be preserved with full jacket crowns or caps. We are very close to tooth implants in animals becoming a reality. These will be especially beneficial for working dogs. Consil® Synthetic Bone Graft Particulate has been utilized at Silver Sands Veterinary Center and at the Centers for Oral Care, for years, in periodontal and osseous defects. Originally earmarked in alveolar ridge maintenance following extraction and treatment of infrabony osseous defects, its scope of utilization has broadened significantly through the years. Consil® is an osteoconductive bioactive device used for grafting osseous defects.